As I mentioned in a previous post, 1928 was rough for my West family. Their patriarch had died the year before, and their matriarch and two sons – including my Papa Ed’s father – all died in 1928. We’ve had years like that in my lifetime, so I know they were not happy campers back in 1928. Surely good things were in store for 1929…! 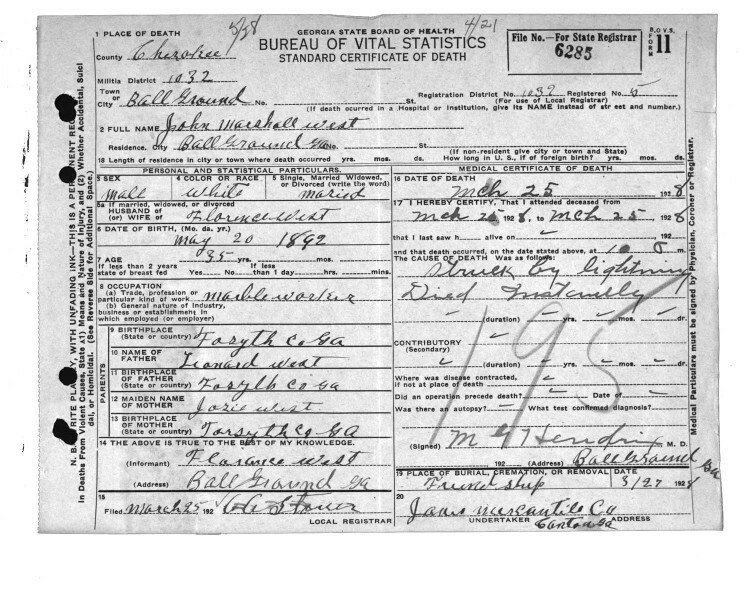 Georgia Death Certificates from 1918-1927 are easily findable online through a free search at FamilySearch.org. But what isn’t as readily apparent is that Georgia Death Certificates from 1928-1930 are also online at the Georgia Archives. They’re just a little hard to find. 1. Click over to to the Virtual Vault site at the Georgia Archives. Behold all the cool stuff there. Try not to get lost. 3. Read the dang instructions. 4. Or I’ll summarize them for you: First, pick the year you want to search from the “Year” dropdown menu. Second, from “Record Type” dropdown menu, pick “Index.” You’ll have to manually navigate over to the surname you are searching. For example, it will say “1928 Index A” and that will mean surnames that begin with A. It isn’t entirely intuitive. 5. Once you find your ancestor, jot down the number next to their name. (You don’t need to worry about the letter.) That will be their death certificate number. 6. From there, navigate back to the search page. This time, pick the same year in the “Year” dropdown, but pick “Certificate” in the “Record Type” dropdown. From there, you’ll once again have to manually navigate until you find the record number you jotted down. 7. And viola! There is your ancestors death certificate. Try to decipher his or her cause of death and then not immediately diagnose yourself with early signs of dropsy or Spanish influenza or whatever. I dare you! While you’re at the Georgia Archives site, check out “Vanishing Georgia” for old pictures, sorted by county. I dig this one of Forsyth County Georgia ladies playing croquet. My ancestors would have been the ones with horse poop on their shoes growing the food for their post-croquet banquet. Thanks for that Georgia information! You are a peach! Haha Literally! I was born right in Canton, GA. You are quite welcome for the share! I’ll be adding your blog to my Feedly, too!